The artist said that it was important for her to show the return of the sacred space, the light in the souls, for people do evil precisely under conditions of godlessness! She also noted that she wanted to show the path of the artist which one had to endure in a land of distorted mirrors while keeping one’s soul pure. She also recalled Kobo Abe’s parable novel The Woman in the Dunes, because it was there that she discerned that in any mental wilderness, in any emotional trap of tragic loneliness in the absurd nonsense of life, one still could find life-giving moisture. “We live in a beautiful place called Ukraine. We must be able to tolerate others and at the same time to be self-sufficient and strong,” the artist said, and added she was creating a Cosmic Edifice through her artistic images, because our land has a sacred meaning – it is holy, bestowed on us by God as inheritance. And we must love and defend it at the same time. 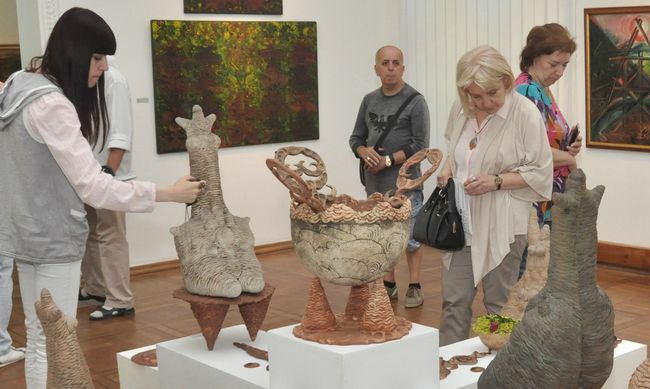 The retrospective exposition will run until July 8.